In short: A rich rewarding read. This is Peter's first stand alone novel since Fallen Dragon. We start with a murder in Newcastle. Detective Sidney Hurst gets lumbered with the career make or break case and to head the investigation. This is no ordinary murder, it is a North, a genetic clone and family member of the North dynasty. There are two disturbing problems with this case. One: There are no North's missing. Two: It closely resembles a mass murder that occurred twenty years previously on St Libra. St Libra is a vast, largely unexplored planet which produced Bioil from which the Earths energy crises was resolved decades earlier. The flow of Bioil is controlled by the North's. Angela Tramelo is the sole survivor of the massacre on St Libra. She was convicted of the murders, but resolutely stated that an unknown alien did it. After a preliminary investigation the HDA (Human Defence Alliance) launch a huge expedition to St Libra to track down the elusive alien whom only Angela has seen to date. Written with rich prose, a fantastic vision, and a character set making this stand alone novel of Peter's one of his best, if not the best. With a cast of over fifty characters, all intertwined and interwoven, we see practically all of them develop through this tome. Peter, is in my opinion, the J. R. R. Tolkien of the SF world for his rich world building. 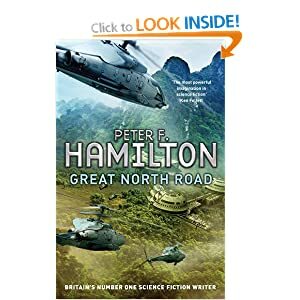 With complete histories, populations and characters, there is no denying Peter's ability to create stunning new vistas which he allows us to explore. I am huge fan, and this book for me only confirms why.